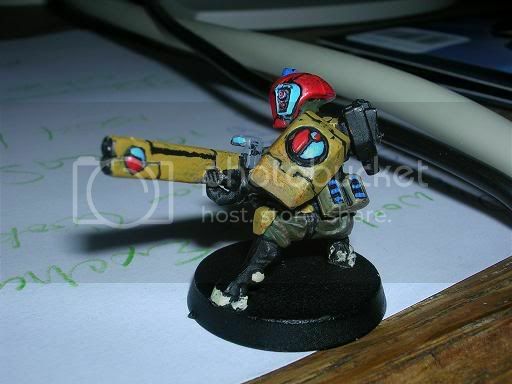 Warhammer 40k Forum Tau Online » Games Workshop/40K Related » Showcase » testin the fire! 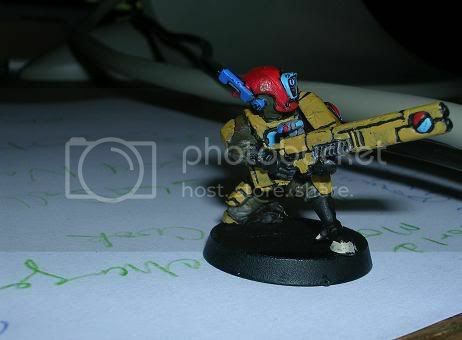 test fire warrior, just got em. kritik! and go! also what color should the pax be? as pointed out by King Solomon (soloplumber) the paint is too flippin thick, as are mny GW paints. I have thinned it and the suits will be ready for the HQ comp. The brown doesn&#39;t look good with the others, and it&#39;s a tad sloppy. The colours are a bit of a nightmarish concoction, but the large number are a nice touch in some respects. The paint looks a bit gummy and thick, which is a bit of a minus but not bad work.